Vic Law looks to pass. The senior forward had 14 points against the Yellow Jackets. After watching his team get overwhelmed in a road Big Ten environment, Georgia Tech coach Josh Pastner made a statement that reverberated louder than anything Northwestern did in the last 40 minutes. Unprompted, Pastner called the Wildcats a likely NCAA tournament team. Then — minutes later — NU coach Chris Collins hated hearing it. With its 67-61 win over the Yellow Jackets (4-2) on Wednesday, NU (6-1) passed the midway point of a 13-day stretch with six games against quality opponents. It started with a letdown, a 20-point loss against Fresno State in the first round of the Wooden Legacy, where the Bulldogs shot 50 percent from the field and hung 78 points on the Cats. 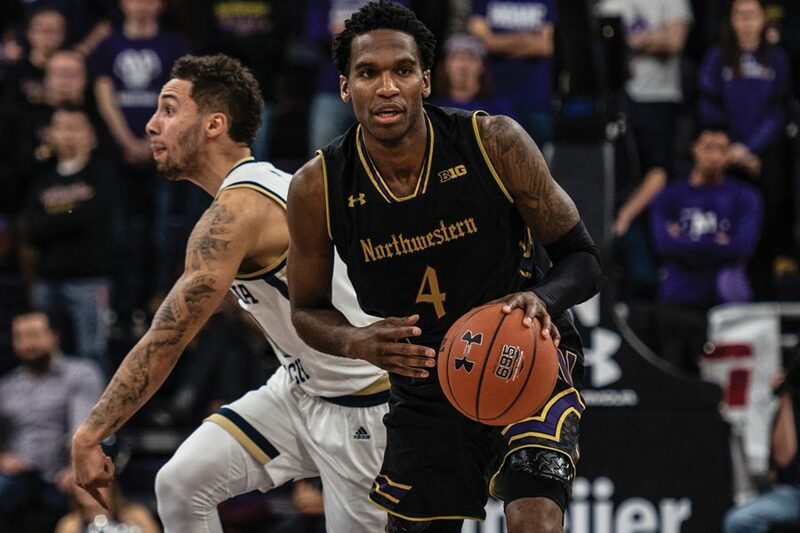 The Cats responded with a timely victory over a winless LaSalle team, and they finished the tournament with a 79-57 win over Utah, the best opponent NU has beaten this season. Having caught the Cats at the high point of the young season, Pastner praised the well-rounded game of senior center Dererk Pardon and the overall improvement of senior forward Vic Law. But Law sees NU in a different light than Georgia Tech’s coach, and with the recent blowout loss in mind, is uncertain about what the team can become. So far this season, Collins said he “hasn’t had too much dialogue” with other coaches and peers in college basketball about how the Cats are viewed outside of their Evanston bubble. With the ups and downs the team has had this season, it remains tough to gauge how NU stacks up in an impressively deep Big Ten. But according to Law, Wednesday’s win showed how the team had moved on from the Fresno State loss. With an upcoming game at Indiana in an environment the Cats have historically struggled in and a home matchup against No. 7 Michigan after that, NU had to use the last three games to figure out the struggles it showcased early in the year and especially in the Fresno State game. And while the Cats are far from a finished product, Law said they are taking their mistakes in stride and using it to get better.